Yu-Gi-Oh! Monster Capsule: Breed and Battle (遊戯王 モンスターカプセル ブリード＆バトル Yugiō Monsutākapuseru Burīdo ando Batoru), frequently abbreviated "MCBB", is the first Yu-Gi-Oh! video game, released by Konami on July 23, 1998 for the Playstation. It features a more well-developed variant of the Capsule Monster Chess game from the manga. Monster Capsule: Breed and Battle is the only video game to feature Capsule Monster Chess, though Yu-Gi-Oh! Monster Capsule GB features a modified version of the game and many of the monsters from MCBB, and Yu-Gi-Oh! Capsule Monster Coliseum features the spinoff game Capsule Monsters. Yu-Gi-Oh! Monster Capsule: Breed and Battle primarily features characters from the Yu-Gi-Oh! manga. The player raises and trains Capsule Monsters to defeat opponents in a tournament. 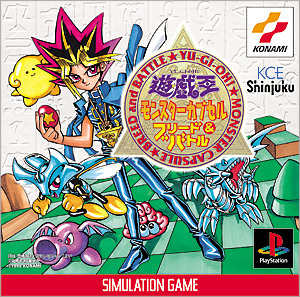 Opponents include Yugi Mutou, Katsuya Jonouchi, Anzu Mazaki, Mokuba Kaiba, Ryo Bakura, Sugoroku Mutou, Seto Kaiba and Dark Yugi. It was similar to the virtual pets. It can evolve into other monsters. This page was last edited on 6 June 2016, at 20:30.